The Fed sacrificed the foundation of middle class wealth–stable housing values–to boost bank profits. Lest you think the phrase “death of the middle class” is hyperbole, please examine these two charts, keeping in mind the middle class by definition must be in the middle of income/wealth distribution–conventionally, between 40% and 80%, i.e. 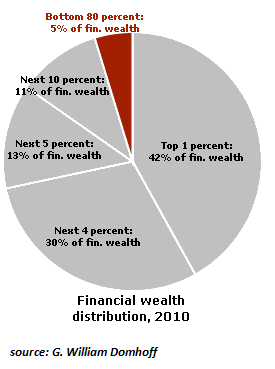 the 40% between the bottom 40% and the top 20%. See that little red wedge? That’s the bottom 80%–the entire middle class and everyone below the middle class. 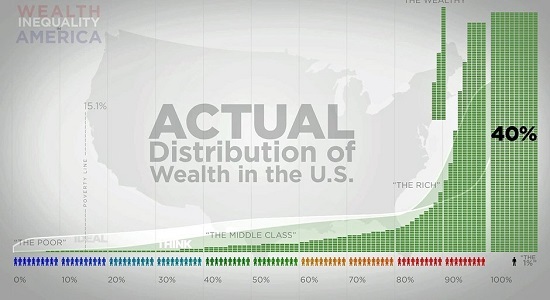 Here’s another look at the wealth distribution: the middle class’s share of wealth is modest, unless you define the top slice of households just below the top 1% as “middle class.” But since the top 19% cannot be in the “middle,” attempting to boost the wealth of the middle class by including the wealthy is truly Orwellian. 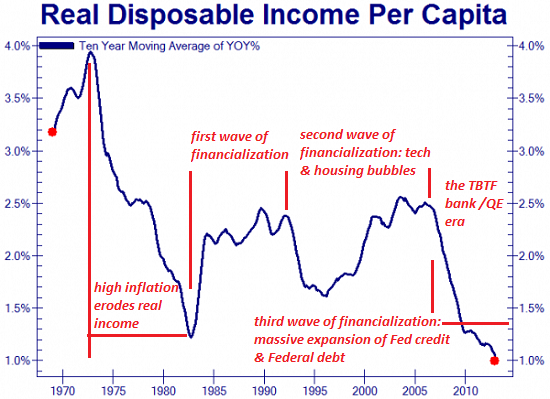 The next chart shows how financialization boosted asset valuations in waves of boom and bust. Some of the first two waves of financialization leaked into wages, but the Fed’s bubble-blowing since 2009 has failed miserably to increase incomes: disposable income fell off a cliff in 2009 and has continued falling, despite the Fed’s blowing new bubbles in bonds, stocks and housing. So what does the Fed have to do with the death of the middle class? As noted inWhat’s the Primary Cause of Wealth Inequality? Financialization (March 24, 2014), the short answer is when investment returns exceed economic growth, the rich get richer, increasing inequality. Low interest rates and free-flowing credit inflate bubbles. We can discern an implicit agenda in the Fed’s policy of making credit cheap and abundant: since income for the bottom 90% is stagnating, the only way to boost consumption and debt is to inflate an asset owned by middle class households: housing. The Fed responded to the housing crash with an unprecedented policy of buying over $1 trillion in home mortgages (mortgage-backed securities), roughly 10% of all existing mortgages in the U.S. In conjunction with the Fed’s other policies (purchasing Treasury bonds and relaxing banking rules) and the opening of the loose-lending FHA spigots, housing recovered nicely–until the Fed slackened the pace of its purchases of bonds and mortgages. Housing immediately began trending down. 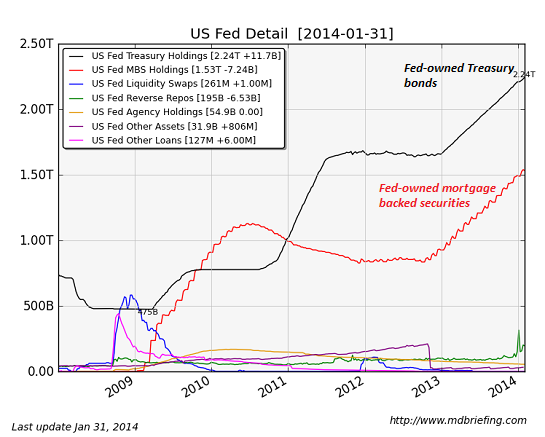 In essence, the Fed’s bubble-blowing forced every homeowner into becoming a speculator. 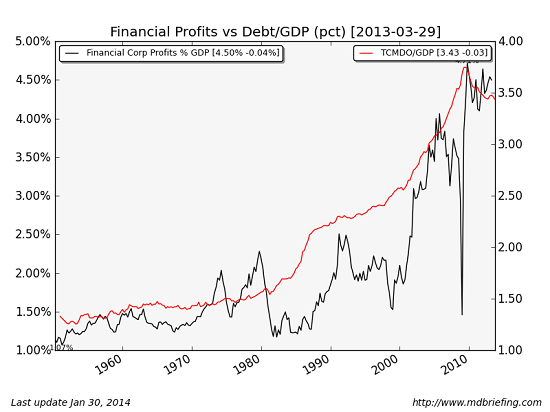 There’s another agenda at work of course: increasing debt and bank profits derived from debt. What better way to insure banking profits than to spark a speculative bubble in the core asset of the middle class–housing. Rising prices created temporary (and enticing) home equity that could be tapped with a loan (HELOCs–home equity line of credit), and the temptation to selling out and moving up the food chain to a bigger home and bigger mortgage was equally compelling. Even better, banks and Wall Street had perfected the securitization of once-safe home mortgages. Banks had no need to take on the risk of holding mortgages–the big money was in originating the mortgages, packaging them into securities and selling the tranches to investors. The much-ballyhooed “ownership society” turned out to be ownership of debt, not equity. Debt is profitable for banks; people owning homes free and clear is not. In effect, the Fed sacrificed the foundation of middle class wealth–stable housing values–to boost bank profits. Take a look at what happened to financial profits in the 2002-2007 housing bubble: they skyrocketed to new heights. And look what happened when housing and the banks’ securitization scams blew up: financial profits completely collapsed. Middle class wealth was Fed to the sharks. As the current housing bubble deflates, the investor-buyers who fueled the rally are exiting en masse: what’s the value of an asset when the bid vanishes, i.e. there’s nobody left who’s willing to pay today’s prices? 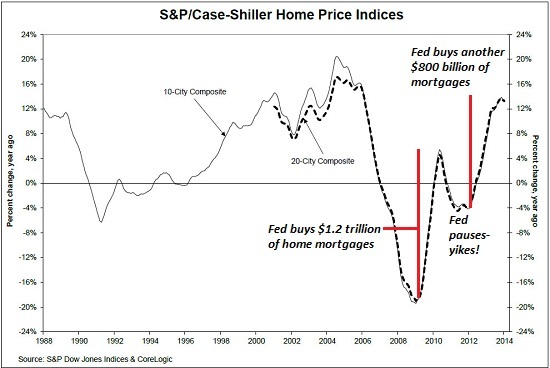 The Fed has failed to restore middle class wealth with its latest housing bubble,and the costs of the bubble’s collapse will fall not on the Fed but on those who believed the recovery was more than Fed manipulation. This entry was posted in General and tagged asset bubbles, credit bubbles, Federal Reserve, financialization, housing, MBS, middle class, mortgage-backed securities, mortgages, securitization, wealth inequality. Bookmark the permalink.